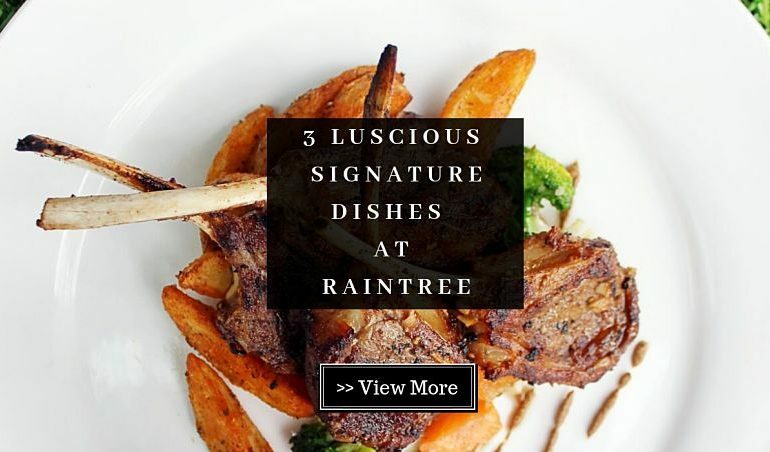 While looking for a restaurant with an alfresco to chill after a hectic week, I came across Raintree – a restaurant at Menara CIMB with a mix of Thai and Western cuisine which houses a relaxing alfresco. Impressed with its minimalist design yet vibrant ambience, I and my friend made a visit with no hesitation. Once settled down, I just couldn’t wait to try the food here and also to share with you the best dishes you must not forgo when come to the restaurant. That’s why I had a friendly staff introduced 3 dishes which are much-loved by Raintree‘s customers. The Lamb Rack was presented in an unpretentious way with the main focus on its flavors (which I was teasing my friend that it “cuts straight to the point” as the name suggested). Perked atop perfectly-grilled seasonal vegetables and potato wedges, the high-quality lamb racks whetted our appetite with its irresistible aroma. We were both amazed by the juiciness of the lamb while the racks were grilled to à point as the meat could easily dry out if it was not handled well. 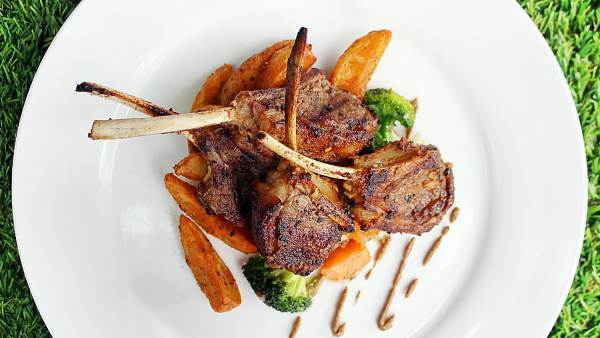 A great delight for lamb aficionados! Our next dish, which we couldn’t stop talking about until now, was the signature Beef Short Ribs. 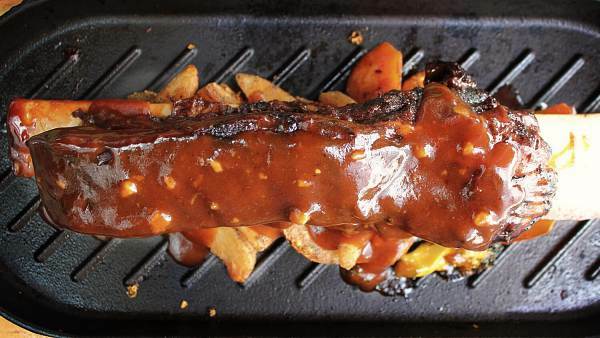 The big chunk of beef short ribs on a sizzling hot pan totally stunned us for a moment. Our first slice into the rib was satisfied as the meat easily fell of the bone, promised a melt-in-the-mouth sensation. Of course, it didn’t let us down with the well-marinated, fork-tender meat and the splendid BBQ sauce. 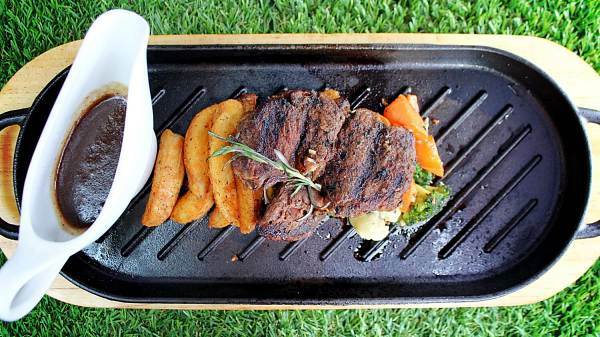 Finally, we finished our meal with a true show stopper – Raintree’s signature Rib Eye. I have always been a big fan of rib eye and for sure I had some expectation for this signature dish. I was delighted as the rib eye was absolutely luscious. Using fine ingredients and top-quality rib eye, the chef skillfully preserved the meat’s juiciness and taste with a touch of the house-made black pepper sauce. The sauce itself was an exquisite combination that accentuated the flavors of the rib eye. The seasonal vegetables and potato wedges are worth-trying as well! TABLEAPP ELITE members can redeem these 3 dishes for free! Find out more about TABLEAPP ELITE here. Location: Level 2, Menara CIMB, 2, Jalan Stesen Sentral 2, 50470 Kuala Lumpur.